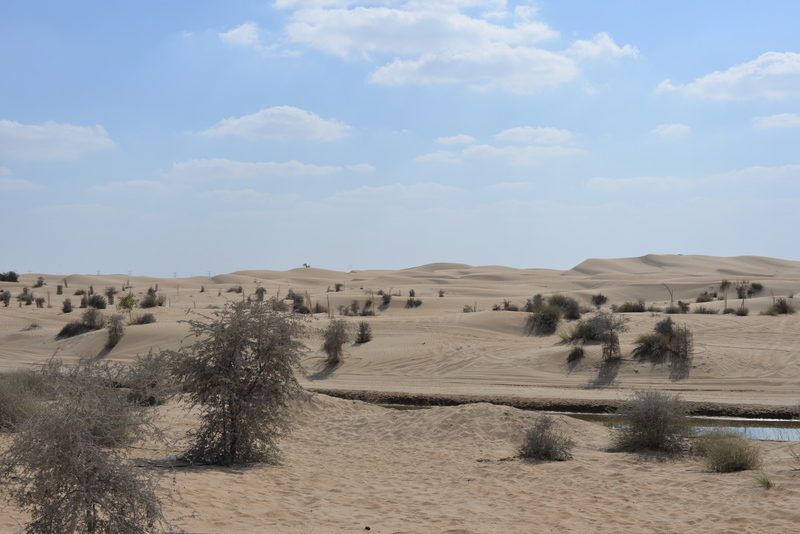 It was a few weeks ago that my husband exclaimed that he wanted to go see “Dubai’s new lakes” – I didn’t have a clue what he was talking about! But I also knew, having lived in the wonderful place that is Dubai for four years, that “new lakes’ may well have been created overnight! So off we popped a couple of weeks ago, picnic packed and excitement simmering. But oh joy, sandstorm! Typical! We sat shivering in the back of the truck eating sandy sandwiches while trying our best to enjoy what were probably incredible surroundings, if we could have seen past the length of our arms! “Ah, we’ll come back next week…” and so we did. This time, with our visiting friends in tow, we set out to enjoy some lunch and a lovely bit of afternoon sunshine. Having let slip that there “might be flamingos there” we also had a very excited five year old girl, who wore her pink flamingo shorts especially for the occasion. Very very cute! So where exactly is Al Qudra Lakes? Well, to be precise, it’s on Al Qudra Road, in the middle of the Seih Al Salam desert and Bab Al Shams. (eh?) So, to put that in expat terms, it’s about 15 minutes’ drive past Arabian Ranches, Mudon area. Stay on the same road up to Al Qudra cycle store and look for the sign that says “Oasis” and you’re there. And what exactly is it? 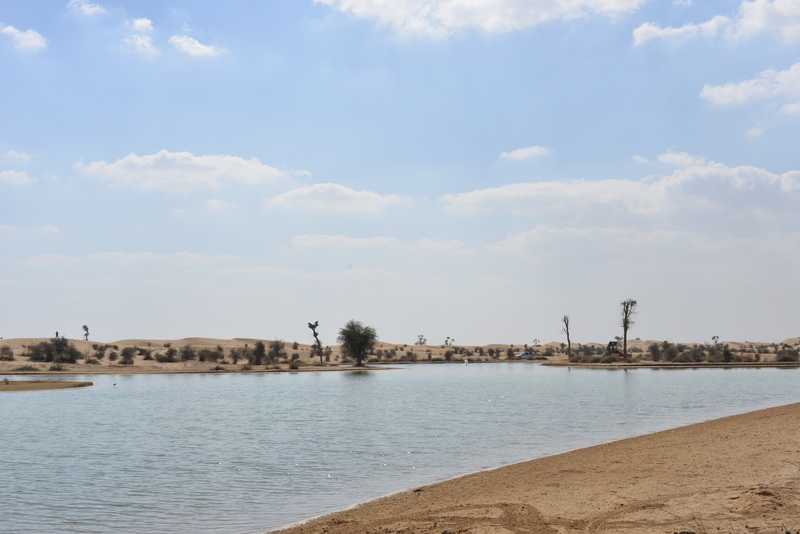 Al Qudra Lakes is a huge cluster of man-made lakes, which are designed in such a way that you can drive around them to explore, set up camp, relax, and watch the wildlife that has decided to settle and call the place home. We stayed about an hour, but with the midday sun getting a little hot we decided to jump back in the truck and explore the other lakes around. Oh and also find the by-then infamous flamingos! Driving around, you’ll see many species of birds. In fact apparently, some 130 species of birds have been spotted and recorded in Al Qudra. Now I am no bird expert, but we did spot a Mr & Mrs Swan with their four beautiful baby swans which was just delightful! So, if you’re like us and love getting outdoors while the weather allows, I would highly recommend the place. You don’t need a truck either – the tracks are well compressed to allow any type of vehicle to drive around. It’s been a great discovery and we’ll definitely be frequent explorers there. And bonus, it’s free! Who says doing things in Dubai needs to be expensive?! Follow me on Facebook for daily updates from life in the sandpit! That indeed is a hidden gem! It must have been a really lovely day for all of you 🙂 Definitely putting it up on my list!! How lovely! We have to go here. We haven’t been but looking forward to it soon. Nice place! I’ll be sure to check out this beautiful Al Qudra lakes.